Yehuda and Katrina Doron convicted of taking 16.5M shekels from Kibbutz Shefayim. Yehuda Doron, the former treasurer of Kibbutz Shefayim, and his wife, Katrina, were convicted Sunday of stealing about 16.5 million shekels from the kibbutz, and of a number of serious financial offenses, which were carried out between 1996 and 2002. Yehuda Doron was born in Shefayim and lived there his whole life, until he and his family were forced to leave when the embezzlement was discovered. He served in several important positions over the years, mostly in the kibbutz's financial department. According to the verdict, he enjoyed unlimited trust from the kibbutz members who believed in his ability to steer the kibbutz's finances. He was also treasurer of Granot, the regional kibbutzim's purchasing organization, between 1996 and 2000. He was convicted of theft by a person holding power of attorney, receiving goods fraudulently, falsification of corporate documents, fraud and breaach of trust. He was also convicted of several counts of tax fraud. His wife was convicted of theft and assisting her husband in his embezzlement. The kibbutzim of Israel were founded as communal settlements with socialistic characteristics, although they have been undergoing privatization in recent decades. 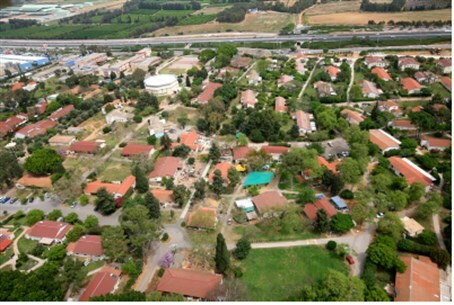 Shefayim is considered a wealthy kibbutz, with a large shopping center among its properties.